The largest investment in Atlanta transit since MARTA was built more than 40 years ago would add light rail, express buses to some of the city’s most congested corridors, and at least two “transit centers,” potentially shaping the development of the auto-oriented city for generations to come. That’s the vision, at least, presented yesterday during a work session at MARTA’s headquarters on how to spend the roughly $2.5 billion in funding Atlanta voters approved in 2016 with an additional .5-percent sales tax. 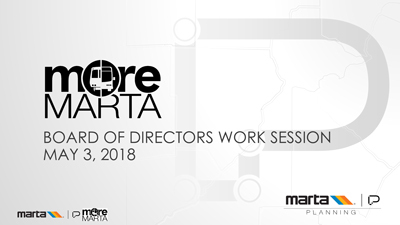 According to a work session presentation obtained by Atlanta magazine, the MARTA tax funding would be spent on light rail lines along a portion of the segments of the Atlanta BeltLine in both southwest and northeast Atlanta. Light rail would also connect the Lindbergh station to Emory University, providing people another way to access the Clifton Corridor, one of the region’s largest job centers that is not near an interstate or currently served by rail transit. 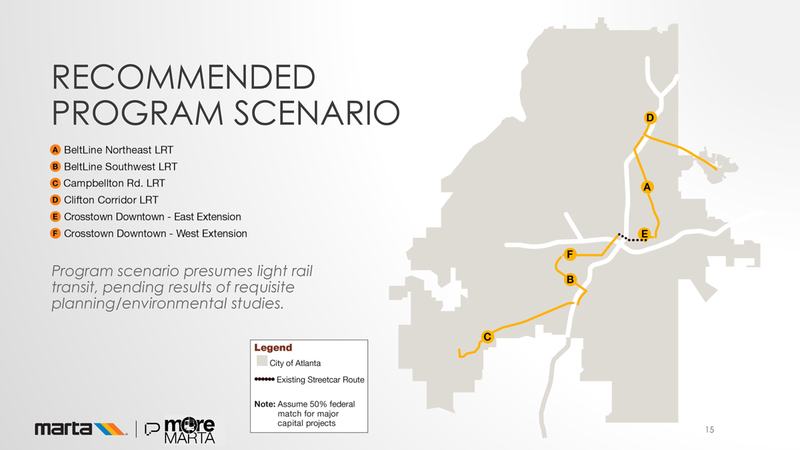 Two east-west light rail lines would also connect to the downtown streetcar, effectively linking the south and north segments of the BeltLine with transit. Finally, Greenbriar Mall in far southwest Atlanta would connect to MARTA’s Oakland City rail station via a light rail line. Mayor Keisha Lance Bottoms lobbied for this line as a member of the Atlanta City Council and mentioned the project on the campaign trail. The result: a squiggly-shaped line of light rail starting at Emory and running southwest through the city, from Emory to Greenbriar. Not every part of Atlanta would benefit from light rail, however, and instead would be better served by bus transit. 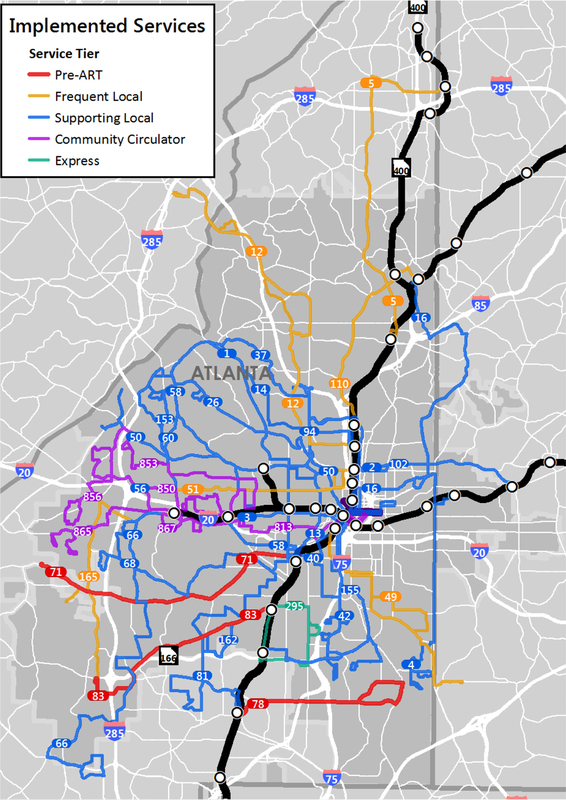 To address this, some major corridors—Northside Drive, Campbellton Road, Capitol Avenue to Turner Field, and North Avenue to Donald Lee Hollowell Parkway—would see bus rapid transit (essentially longer buses operating in their own lanes). 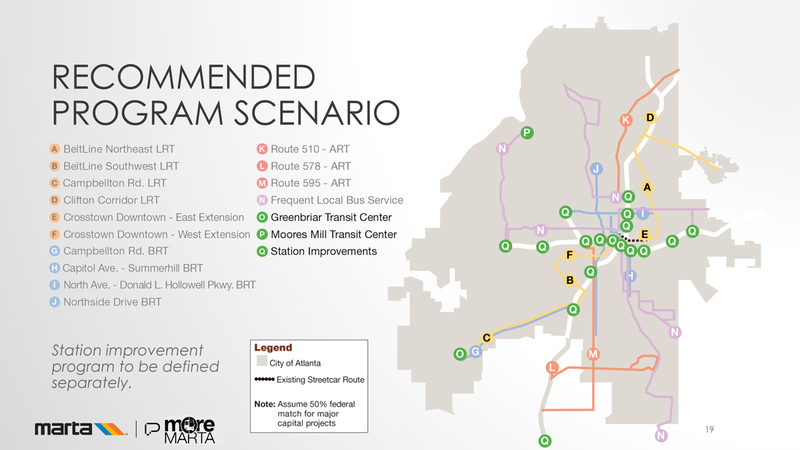 Arterial rapid transit (a stepped-down version of BRT) would serve parts of Buckhead and the southside. When resources are available, investment would be made in adding more frequent local bus service throughout Atlanta, building on the roughly $11 million of the tax funding that’s already been spent boosting and adding routes. Add on top of those improvements two new “transit centers” at Moores Mill and Greenbriar, plus station upgrades throughout the system, and you have a pretty robust transit network. A map showing the proposed light rail, bus rapid transit, and transit centers. Now for the catch—according to the presentation, the scenario has the expectation that the federal government would contribute 50 percent of the total project cost. The likelihood of the feds coughing up a match, stretching the tax revenue even further, depends on who occupies the White House, when the request is made, and how competitive Atlanta’s projects are compared to other cities. However, the Capitol Avenue-Turner Field bus rapid transit line did receive federal aid earlier this year. In addition, the document doesn’t outline when certain segments would be built. Keep in mind that this is early in the process: as we have noted before, lobbying by constituencies for certain routes or modes could affect the final outcome. But at least we have a roadmap of how MARTA officials are thinking, cut down from the universe of options presented to voters before the 2016 referendum. 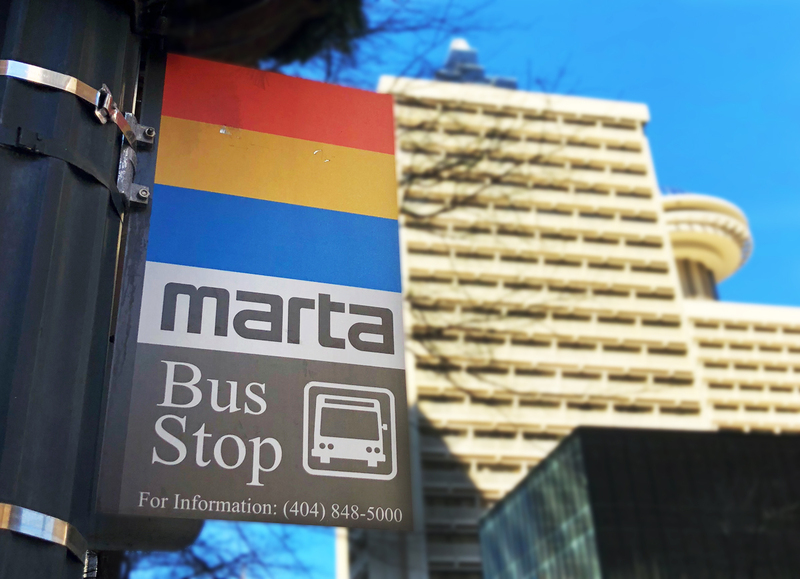 What’s next: MARTA and city officials will seek public input on the scenario, make any needed changes, and, perhaps this fall, vote on what should be adopted. Stay tuned. Atlanta’s potholes are out of control. Could a new city department of transportation finally fix them?